Regardless of your age, you’ve probably heard of the search for the Holy Grail, or at the very least watched Monty Python’s movie, “Holy Grail.” And while everyone is probably searching for their own holy grail, scientists in Illinois may have just gotten incredibly close to finding the treasure that any crop producer has been searching for. In field testing across two different growing seasons, they showed >25% increase in biomass of pathway 3 plants compared to wild type, and with RNAi productivity increased by >40%. We can only imagine the conversation among the scientists when they discovered a way to increase crop growth by 40% in the field. Really, something we thought never possible. Something we only dreamed of. We’d get excited over a 4% yield increase, but a 40% increase? It’s not a typo…it’s a Holy Grail for growers. So how can this really be? Something that stories are made of, a treasure that people all over the world are searching for, has it really been found? Well, it all comes down to photosynthesis. Photosynthesis produces toxic by-products that reduce its efficiency in crop growth and the quest to somehow improve or fix photosynthetic inefficiencies has been the focus of University of Illinois and Global Change and Photosynthesis Research Unit researchers from the United States Department of Agriculture–Agricultural Research Service in Urbana. Large gains in crop productivity are possible through enhancing photosynthetic efficiency. In some of our most useful crops (such as soybean, rice and wheat), photorespiration deals with these by-products, converting them into metabolically useful components, but at the cost of energy lost. But researchers constructed a metabolic pathway in transgenic tobacco plants that more efficiently recaptures the unproductive by-products of photosynthesis with less energy lost. In field trials, these transgenic tobacco plants were ∼40% more productive than wild-type tobacco plants. You got that right…40% more productive…not in a lab setting, not in some hypothetical situation, but in a real world field. Ok, sounds good so far, so what happened when they did all this? In greenhouse screens, pathway 1 increased biomass by nearly 13%. Pathway 2 showed no benefit compared to wild type. Introduction of pathway 3 increased biomass by 18% without RNAi and 24% with RNAi, which were consistent with changes in photorespiratory metabolism and higher photosynthetic rates. Ultimately, field testing across two different growing seasons showed >25% increase in biomass of pathway 3 plants compared to wild type, and with RNAi productivity increased by >40%. In addition, this pathway increased the light-use efficiency of photosynthesis by 17% in the field. 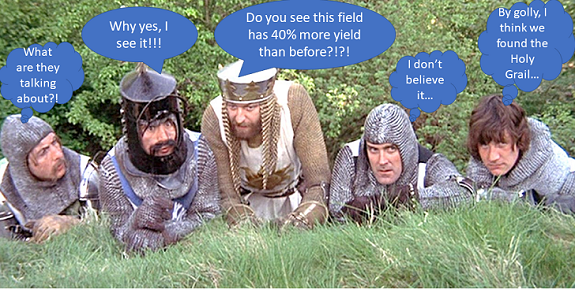 When we are accustomed to getting excited over a 4% yield growth, these numbers are indeed like finding the Holy Grail. So what does this all mean for growers? It means it is possible to up crop yields by percentages never thought possible before, all thanks to engineering more efficient photorespiratory pathways which markedly increased both photosynthetic efficiency and vegetative biomass. “We are optimistic that similar gains may be achieved and translated into increased yield in C3 grain crops because photorespiration is common to all C3 plants and higher photosynthetic rates under elevated CO2, which suppresses photorespiration and increases harvestable yield in C3 crops,” said Paul South and the other authors and researchers in their report. We have to agree about their optimism, but it goes beyond growers. While this could yet be the Holy Grail that growers have been looking for to improve crop yield and should then improve their profits, it goes beyond that. This could potentially lead to lower costs for buyers of these crops. Think about it…growers grow 40% more on their fields, yet they don’t need more land or resources to grow 40% more, so they have more to sell. This could lower the price of those feedstocks so that buyers benefit from this as well. Could this lead to lower cost biofuels and biomaterials? If this type of huge crop yield increase really does translate over to other crops like soybeans, corn, jatropha, miscanthus and any of the many other biofuel and biomaterial feedstocks, then this is indeed like finding the holy grail, and not just for growers.